The best way to make repairs on your Maytag washer is to take the washer cabinet apart. When you take apart the Maytag washer you will have full access to all of the working mechanisms inside the washer. This makes repairs quicker, and will also provide an opportunity to test and troubleshoot the entire washer. The Maytag washer uses few fasteners to secure the washer together. Disconnect the Maytag washing machine power cord from the wall. Turn off the water at the wall spigots. Pull the washer away from the rear wall and set a bucket under the water supply hoses at the back panel of the washer. Loosen the water hose connections from the back of the washer with a pair of channel lock pliers. 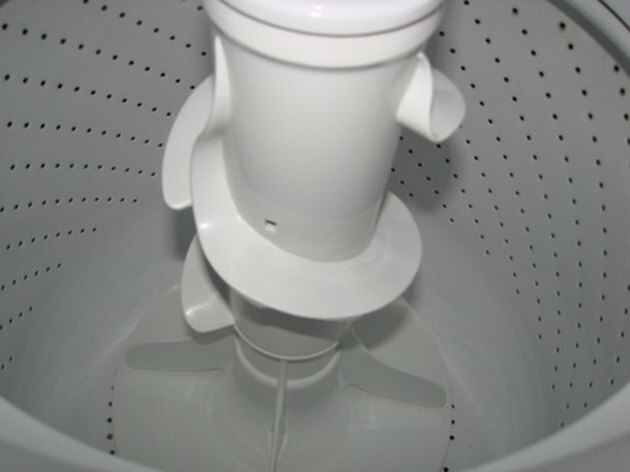 Remove the hoses from the washer and place the ends into the bucket. There will be residual water, so it is a good idea to also have a towel nearby to wipe up any spills. Locate the three screws on the top rear edge of the control panel that secure the control panel to the rear of the washer. Remove the three screws with a Phillips screwdriver. Rotate the control console forward and unhook the tabs on the bottom of the control console from the holes in the top of the washer. Wrap small pieces of masking tape around the wires connecting to the various components inside the control console. Mark the tape with a pencil to indicate what component each wire connects. Remove the wires from each individual component by pulling the wire end from the component terminal. Inside the control console you have full access to the temperature switch, pressure switch, speed switch and the timer. Remove the two screws securing the lower access panel to the front of the washer with a nut driver. The screws will be near the floor on the bottom edge of the access panel. Pull the access panel away from the washer. Removing the access panel gives you access to the water pump, drive belt and drive motor of the washer. Locate the two screws securing the bottom of the front panel to the sides of the washer. Remove the screws with a nut driver. Swing the bottom of the front panel toward you and pull down to disengage the top of the front panel from the top panel. Place masking tape across the laundry lid on the top panel. Remove the two screws securing the top panel to the sides of the washer with the nut driver. Lift the front of the top panel up and back, raising the top panel like a hood of a car. The top panel has two hinges on the rear edge that allow it to rest in a service position. You now have full access to the remaining parts of the washer including the tub, water inlet valves and drive assembly.